A1 Bassline is at interesting time in his career. With a solid catalogue of releases on a variety of labels, he’s an established name on the scene. His standout Buoyancy/Falsehood single and recent collaboration with Leon Vynehall were both quality outings, along with the steady drip of releases on his own SOURCEUNKNWN imprint, yet up until now the UK producer has yet to define the ‘A1 Bassline sound’. His music always has a rough and raw quality, unpolished and floor-focused, but it’s been too long that we haven’t seen A1 Bassline really rise head and shoulders above his peers. With his latest offering, the Intasound EP for Leeds’ Gruuv imprint, it looks like he’s on to a winner, issuing his most distinctive, focused release to date. The title track is the EP’s most dangerous offering: Intasound is a super-stripped example of how to get the ‘floor moving. An elastic bassline takes centre stage, surrounded by larger-than-life claps and clanks, with the occasional vocal used for detail. It sounds simple but the power of this track is undeniable, an example of no-nonsense club dynamite of the highest calibre. As the EP continues he keeps the goods coming but this is no one-act show – the opener’s raw minimalism is not rehashed across the EP’s central numbers. B-side Jaguar Shark is a lot more colourful – the same rough beat patterns might bounce underneath, but here bright, Lone-like synths clatter, fizz and pop over the top, resulting in a much brighter number. It’s all a question of balance though: the drums are still mixed raw and gritty, so the edge of funk in that late soaring synthline hits the spot perfectly rather than over-sweetening it. The classy cuts keep coming – even on the obligatory slow-jam A1 Bassline doesn’t give us a formulaic affair. On Lust In Warsaw the mood is spread syrup-thick, as gently insistent synths and stumbling, dubbed-out vocals whisk you away into a blurry fever-dream. After these great original productions, hardware legend Mr G takes to the stage for a remix of the EP’s title track. It’s a canny choice, as A1 Bassline’s style in many ways references G’s raw style and mammoth basslines, yet here on his Ibiza Dub Mr G comes up with a surprise. Eschewing the original’s hefty bass-bounce, the dub focuses on the details, building a deep soundscape of menacing atmospherics and metronomic hi-hats. While it lacks the dancefloor potential of the original, as a focused mood-piece it’ll have you coming back for more. 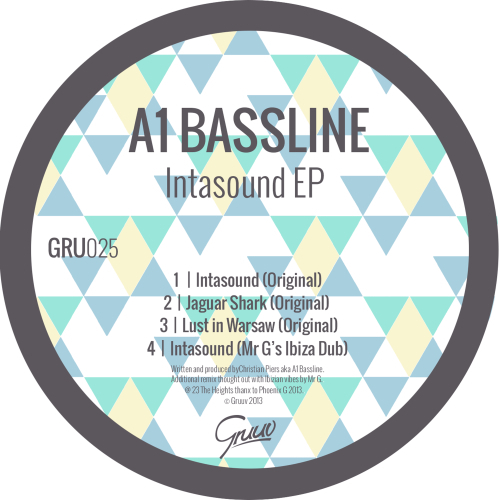 As a whole Intasound makes for A1 Bassline’s strongest release to date, as he securely strikes a balance between rawness and richness in his sound, settling into a voice more unique - indeed more exciting – than he ever has before.